My husband and I spent 2005-2010 living in the amazing, wonderful country of Indonesia. We invested those years into a community, city, and culture that shaped so much of who we are. We loved it. Then we came home, at least to our other home, and started over with life in the States. We recently passed the "we've been home from the field" for five years date. It wasn't a day I acknowledged to anyone other than my hubby, but there was this painful, hollow ache that began to form in my heart. It was one of those aches I thought maybe a 3-in-1 packet of coffee and a good cry would cure; I realized it wasn't going to be quite that simple. But someone please tell me to drink the 3-in-1s before they go bad! I sort of got a little excited when we went back and visited Indonesia last year and bought way. too. many. I think a lot of ALL THE FEELINGS have stemmed from my first class of 4th graders in Indonesia graduating. Really?! Seeing their sweet, beautiful, and So. Stinkin'. Grown. Up. faces brought the tears fast and crazy, streaming down my cheeks. They're now heading off into the world, and the odds of our paths crossing on this earth again have become even smaller. This kind of grief and longing...it's something few people understand. While I wouldn't change a thing, this having-two-homes-on-opposite-sides-of-the-world thing isn't for the faint of heart. And so a few weeks ago, I just whispered a prayer. I had to. God? I know it seems so far out of reach, but is there a chance that maybe you want us there again? Can I have Indonesia again? Which, of course, was a ridiculous prayer. We love where we are. If we ever moved, I would cry more than the world has ever seen. It would be completely heartbreaking to leave the place that God has rooted so deeply into our hearts and lives. But the ache in me was so strong at that moment that I wanted my Indonesia again. And after I uttered that prayer, I pretty much let it go. I knew God wasn't going to answer it. And then a Monday night came. My husband and daughter were down at the river a block from our house, exploring and playing, and I was hanging out on the back porch with my guitar and a couple new songs. Normally, I just strum and sing and fix the chords I play wrong, but that night, I'd pulled my laptop out there so I could change the key of a song and have the chords in front of me. For some reason, I had stayed logged into Facebook, which is not something I typically do. And I heard the notification button go. Sometimes I'll ignore it, but I had a strange urgency that I needed to look. The message was from an Indo friend and his wife. We're stuck in Chicago for the night. We've got a pull out couch and can pick you up at the airport! I'm pretty sure I was leaping from the furniture, guitar in hand, by this point. And a few messages and 90 minutes later, they were sitting on my couch, and I was having this crazy little conversation with God in my head. He knew. He always does, doesn't He? 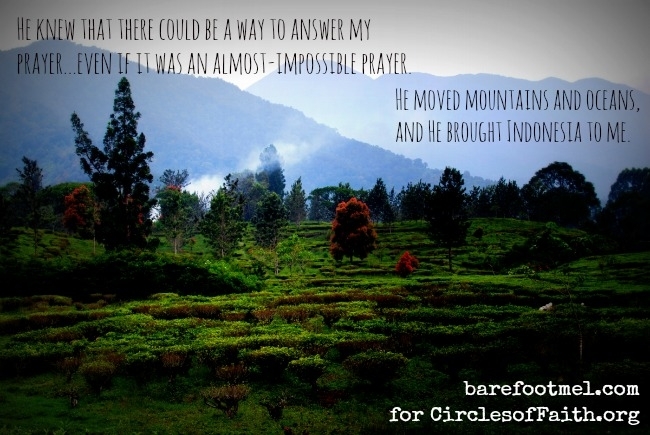 He moved mountains and oceans, and He brought Indonesia to me. And it makes me wonder why I doubt Him. We had a precious 19 hours with some dear friends, and it was the taste of my other home that my heart so desperately needed. I hated to send them on their way, but the reminder of their visit is something that will make me smile for a long time. And maybe, for a while, it will help me miss Indonesia just a little less, too. Older PostWhat Happens When Women Gather with Christ as Our Center?